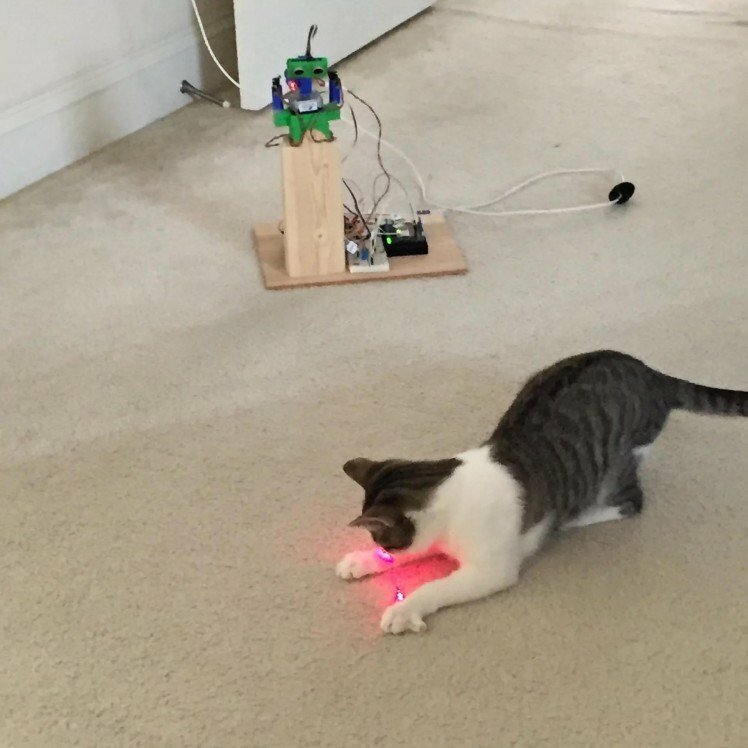 Chasing the infamous red dot of a laser pointer is a favorite hobby for our family's feline friend. Sometimes you have an idea on how to solve a problem and look for the electronics to make it happen. Sometimes you have the electronics and must manufacture a problem to solve. 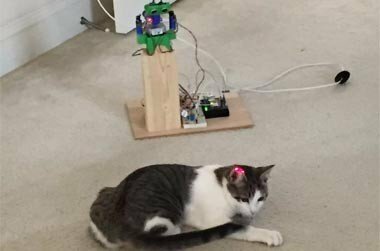 This open source project is in the latter category and uses a stepper motor and the STM32 Nucleo to have a little fun with our four legged companions. Chasing the infamous red dot of a laser pointer is a favorite hobby for our family's feline friend. 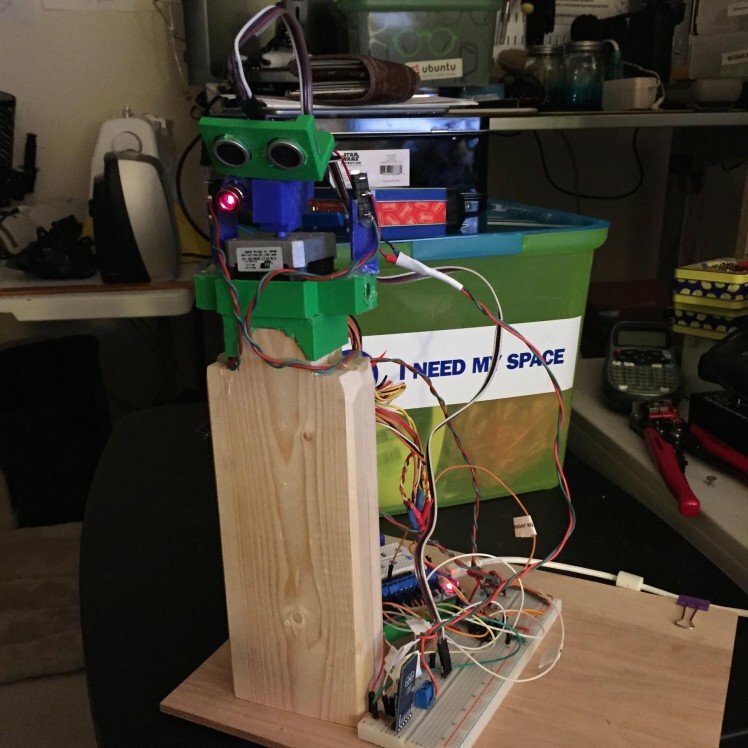 Figure 1: BuddyBot is an Android device-controlled laser pointer mounted on a stepper motor using a $10 STM32 Nucleo. 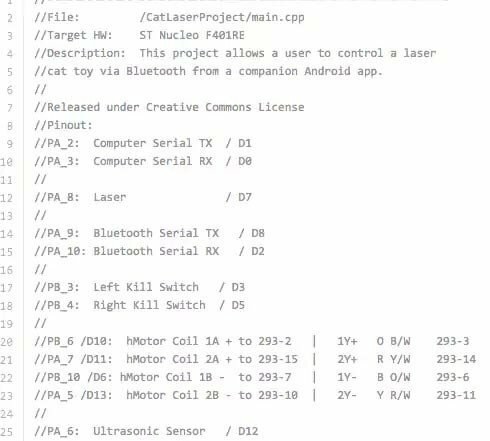 Actual Bluetooth range is around 15 - 30 ft.
We're engineers and makers, so just waving around a laser pointer with our hand isn’t going to be enough; we must add a little electronic magic… This device will let the user control the laser pointer remotely via an Android app. We'll also add an automated "robot mode” to keep them entertained automatically. The schematic is provided in both .PDF and .SCH on the Source Files page. Move a stepper motor remotely using an Android device as a remote control via Bluetooth. Move a stepper motor remotely at random. 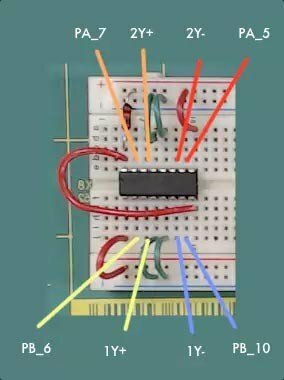 Practice basic circuit concepts such as the voltage divider and pull-up resistors. Use additive manufacturing techniques to build the "mechanical" portions of your electronics project. The Brains: We will use an STM32 Nucleo F401RE microcontroller platform to tie all our components together. The STM32 Nucleo is programmed using the C/C++ language. Figure 2: The STM32 Nucleo has a detachable, reusable programming card at the top that is removed once a project is ready for final deployment. it makes adding third-party libraries a breeze. We will use the latter feature to add a pre-built library to interface with our ultrasonic sensor so we can enable an automatic “robot” mode for our BuddyBot. I have also provided a link to the STM32 Nucleo code here to help get you started. 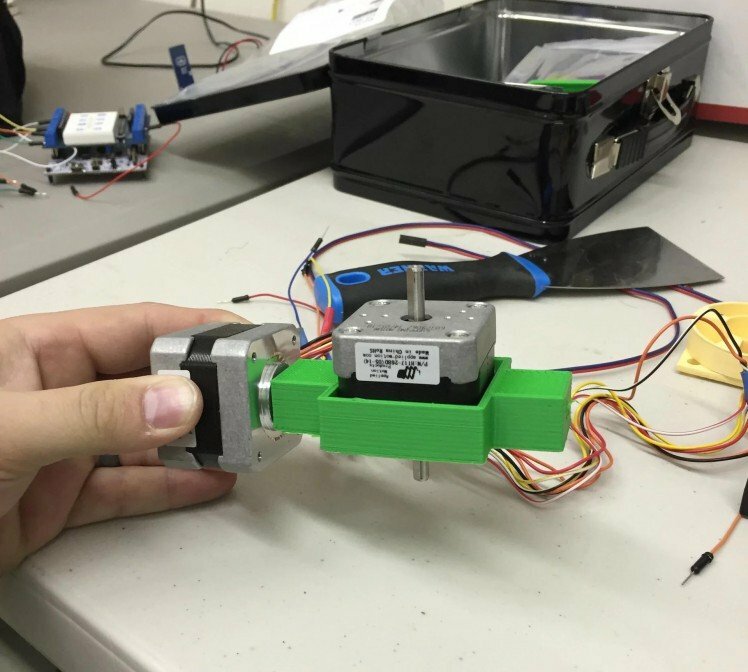 The Brawn: A NEMA 17 stepper motor will provide the rotation of our laser and ultrasonic sensor. 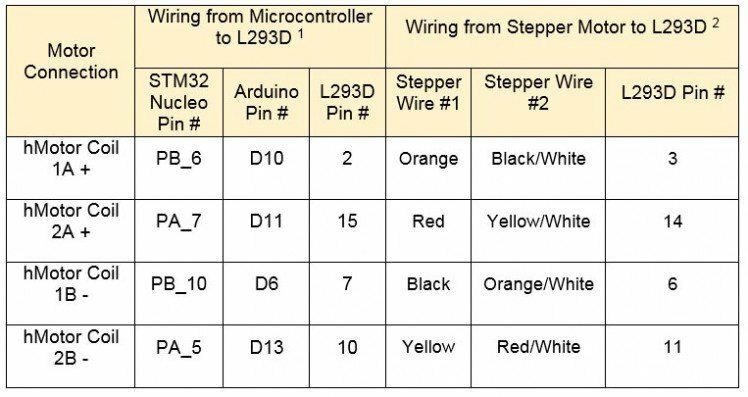 We will also use a L293D dual H-Bridge motor driver microchip to provide the interface and some protection between our microcontroller and the stepper. 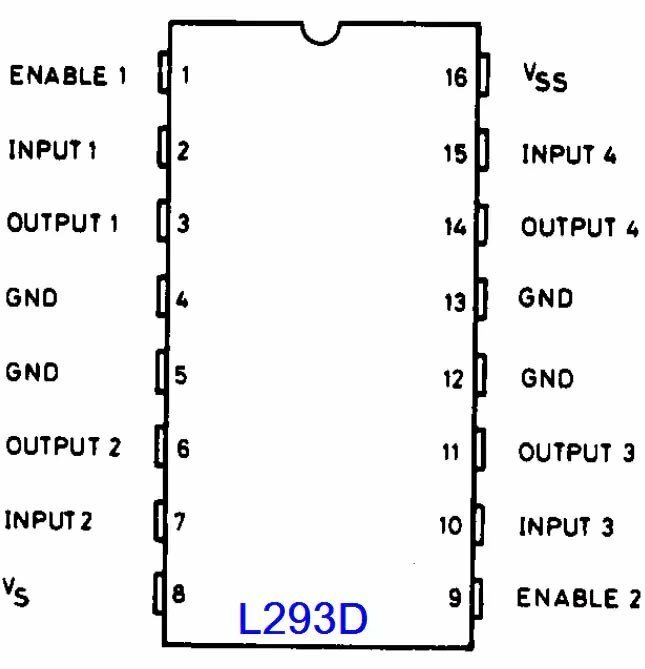 Important note: the ‘D’ at the end of L293D signifies that it has the built-in flyback protection diodes. There are also L293 chips that do not have the diodes, so be sure to pick the right ones when ordering if you don’t use the ones in the project cart already. The diodes are key in preventing blowback voltage from the motor coils from frying your microcontroller. Blowback voltage results when the power to the relay coil gets switched off and the magnetic field starts to fade. Current can flow back into your microcontroller if you leave it unprotected. Cutting the Wires: We will use a RN42 Bluetooth board to provide the serial communications link between our STM32 Nucleo and our Android app. To make things easy, we will be using MIT’s App Inventor software to develop our app. In addition, I have provided the .aia file if you want to upload it into your App Inventor account and tinker with the code. Or if you just want the app, Green Shoe Garage has published it in the Google Play Store. Figure 3: The BuddyBot Schematic. Click to enlarge. a. Gently secure the L293D chip into the breadboard to avoid damaging the pins. b. Hook up the ground rail (GND) to the pins that need a connection to GND; this includes pins 4, 5, 12, and 13.
c. Run a 10k-ohm resistor for the Vcc rail to pin 1 which is the enable pin for the chip. d. Run a wire from pin 1 to pin 9, which is also an enable pin. e. Run Vcc directly into pins 8 and 16 to provide the power to drive the motors. f. If we had a large load, we would have to use an external power source for these pins. But since the load is small, we can drive it off the 5V from the STM32 Nucleo with no problem. We will revisit this when we wire it up to the motor and the STM32 Nucleo later on. a. If needed, extend the wires of the laser by soldering an additional length of wire. Be sure to insulate the solder point with electric tape or heat shrink. b. Insert the screw terminal block onto the breadboard. c. Connect one terminal of the screw terminal to GND. d. Connect the GND wire of the laser to the GND terminal of the screw block. e. Connect the Vcc wire of the laser to the other terminal of the screw block. f. Connect a wire from the STM32 Nucleo pin PA_8 to the same row on the breadboard as the Vcc laser terminal. g. This allows us to toggle the laser on and off in the software we will write later. a. Place a strip of 3 male header pins on the breadboard. b. Then we provide a connection to Vcc and GND to the header pins. c. The signal output pin of the ultrasonic sensor can be ran from the header pin directly into the STM32 Nucleo’s PA_6 GPIO pin. We will use the pulseIn function of the STM32 Nucleo to read in the ultrasonic sensor signal. d. Ensure that you match the pins on breadboard to the pins on the PING sensor. Looking at the front of the PING sensor the order of the wires is SIG, Vcc, GND. a. First let’s solder some pretty long wires to our micro lever switches. b. Using a multimeter, check to see the normally open (N.O.) position for your switches. Solder a wire to each of the terminals. I prefer to use a red and green color wire to differentiate terminals. Connect one end of the 10k-ohm resistor to GND and the other end into a row on the breadboard. Connect the red wire of the limit switch into the Vcc rail of the breadboard (the row marked +). Connect the green wire of the limit switch to the same row on the breadboard as the 10k-ohm resistor. d. Connect the left limit switch to STM32 Nucleo pin PB_3 by tapping the point between our left limit switch and its 10k-ohm resistor. e. The right limit switch will connect to pin STM32 Nucleo PC_7 by tapping the point between our right limit switch and its 10k-ohm resistor. Place the 7805 into the breadboard. Connect the positive lead of the 10uF capacitor to Vin pin of the 7805. Connect the negative lead to the GND pin. Connect the positive lead of the .1uF capacitor to Vout pin of the 7805. Connect the Vout pin of the 7805 to the Vcc rail of the breadboard. Connect the 5V pin of the STM32 Nucleo to the Vin pin of the 7805. Connect a wire from the GND pin of the 7805 to the GND rail of the breadboard. a. The STM32 Nucleo outputs 5V for logic high. However, the Bluetooth board can only tolerate up to 3.3V. A simple way to resolve this mismatch is to make a voltage divider circuit using a 5k-ohm and 10k-ohm resistor. b. Ensure that one end of the 5k-ohm resistor connects to pin PA_9 on our STM32 Nucleo. c. One end of the 10k-ohm resistor is connected to ground. d. The remaining ends of each resistor will connect at a common node on the breadboard. We will tap off this node and run a wire to the Bluetooth TX pin, which is pin 3 on the RN42 breakout board. e. The Bluetooth module RX pin (RN42, pin 2) can safely connect directly to the STM32 Nucleo on pin PA_10. f. Connect the RN42 pin 1 to the STM32 Nucleo’s 3.3V pin. g. Connect the RN42 GND pin to the breadboard’s GND rail. Figure 4: Illustrated BuddyBot Breadboard. Click to enlarge. Now that the breadboard is wired for our components, we can go back in and add the wires that connect the STM32 Nucleo to the L293D and the L293D to the stepper motor. I chose to wire the motors last since there tends to be a lot of long wires involved and this prevents confusion when wiring up the earlier components. Figure 5a: L293D Pinout Click to enlarge. Figure 5b: Connect the motor and the STM32 Nucleo to the L293D. Click to enlarge. Code that runs on the STM32 Nucleo and controls the motor, laser, and ultrasonic sensor. User Interface (UI) that runs on an Android device. They communicate with each other over a Bluetooth serial communications link that can be initiated from the Android app. Figure 6: A section of the Nucleo main code from BuddyBot_v3_STM32 NUCLEO-f401RE.bin. You can look at an image file of the entire code in the Source Files area for this project as Nucleo_main_cpp.png, located inside BuddyBotNucleoCode.zip or get the code itself inside BuddyBotNucleoCode.zip or on github. 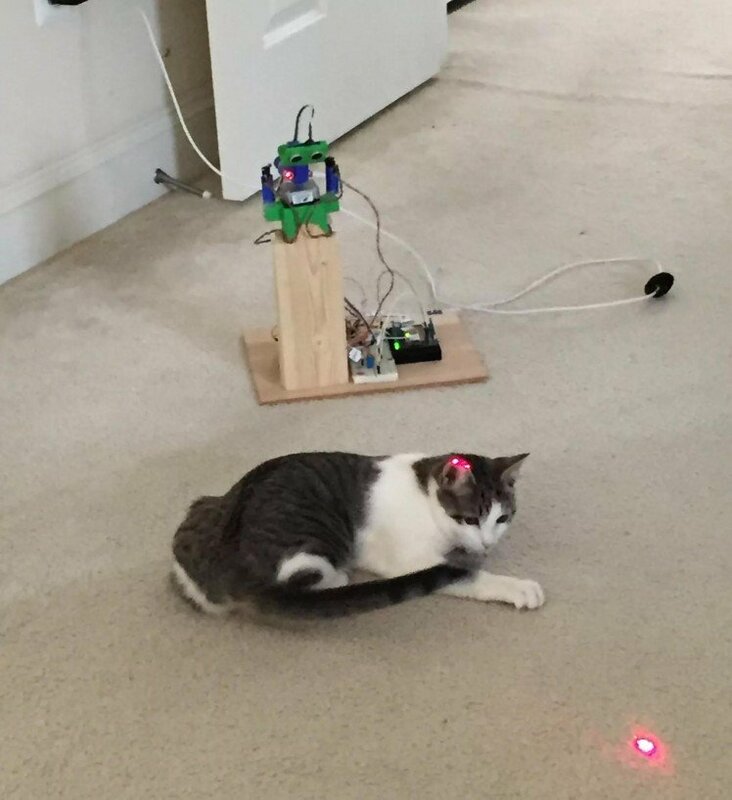 int triggerDistanceCM = 100: This variable is the minimum distance, measured in centimeters, between the ultrasonic sensor and your pet that will trigger a rotation of the motor when the BuddyBot is in robot mode. This will need to be adjusted depending on the height and angle of your ultrasonic sensor. The taller the sensor, the larger the variable may need to be. int _numMotorPulseCycleStandard = 5: The number of motor rotation cycles that will run per click of the left or right button in the Android app. A smaller number will result in a smaller angle of rotation per each button press. int _numMotorPulseCycleMax = 10: This variable performs the same function as _numMotorPulseCycleStandard except it controls the number of rotation cycles that occur when an interrupt is triggered by the limit switches. 3. 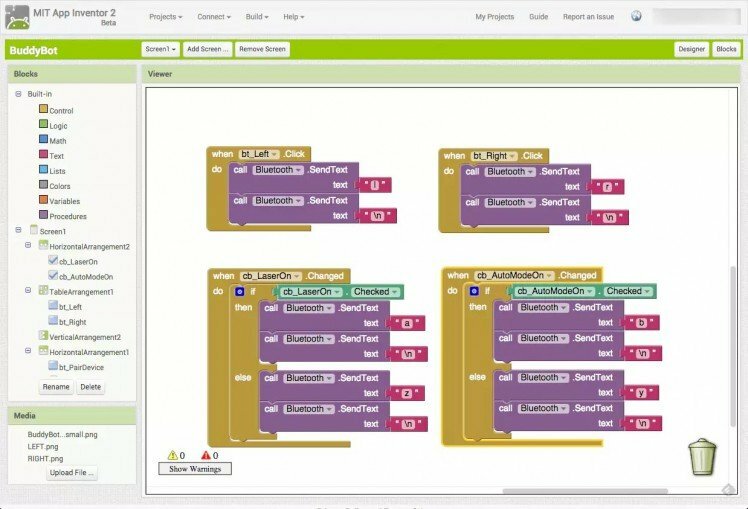 Once you have the code all written, click the “Compile” button to create the necessary .bin file that you will drop onto your STM32 Nucleo. You will be asked where you want to save the file to on your computer. Installing code on the STM32 Nucleo is as simple as dragging the file from wherever you saved it onto the STM32 Nucleo, just as you would click-and-drag any file onto a USB thumb drive. “Laser On” checkbox to toggle the laser on and off. If the checkbox is checked, the laser will turn on. If it is unchecked, the laser will turn off. “Robot Mode” checkbox to toggle the automatic mode. If checked, the motor will move at random without user input. The “Left” and “Right” buttons will be disabled while in auto mode. “Left” button will turn the motor to the left when in manual mode. “Right” button will turn the motor to the right when in manual mode. “Pair Device” button will allow the user to pair their Android device to the BuddyBot. “Connect” button will allow the user to connect to the BuddyBot after pairing the two devices. “Disconnect” button will only appear once a BuddyBot is connected. Pressing “Disconnect” will stop the connection between the Android device and the BuddyBot. Figure 7: A screenshot of Android Designer on the MIT Application Inventor where the very fancy BuddyBot UI was created. Figure 8a: Blocks window of the Android designer screen. Figure 8b: Blocks window of the Android designer screen. Give it sufficient height, and angle the laser accordingly to give yourself ample room for the dot to traverse around your hardware. You don’t want Felix the Cat running into the box while chasing the laser. You may need to tweak certain variables in the STM32 Nucleo code such as triggerDistanceCM in the main.cpp file to account for the height and angle of your laser. Make sure to adjust the location of your limit switches so they are activated before the laser and PING sensor wires get wrapped up around the motor shaft. If you power the device from a USB wall charger (instead of a computer’s USB port), be sure to place a jumper across JP1, or else the STM32 Nucleo will not power the microcontroller. 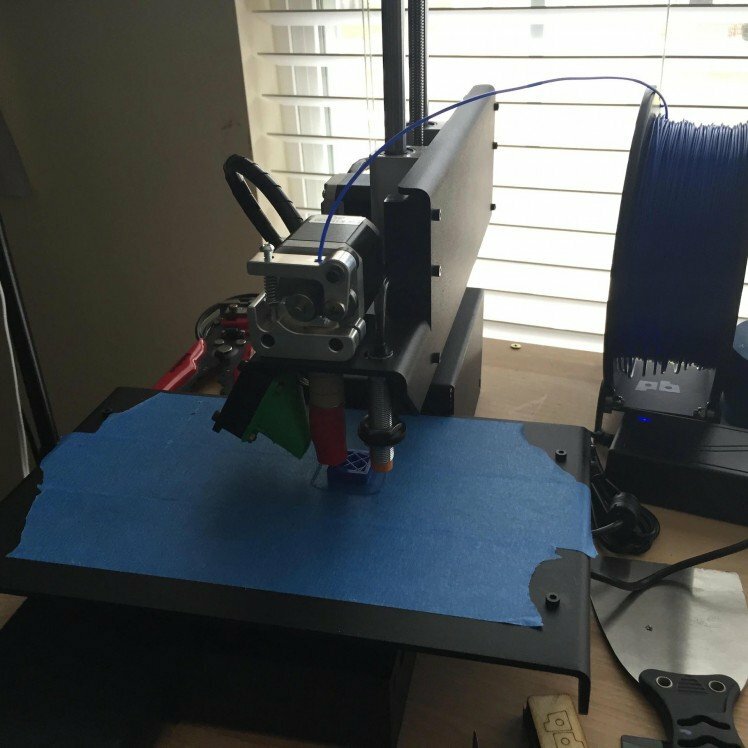 Figure 9: 3D printer files are provided for the enclosure if you have one, but is not necessary, depending on how violent your cat gets when it plays. Time to fire it all up! Plug the USB cable into the STM32 Nucleo and into a wall outlet. Make sure that there are blinking LEDs on both the STM32 Nucleo and the Bluetooth module. Launch the BuddyBot app on your Android device. Click the “Pair” button to pair to the RN42 device. You should only have to ever do this once. Next click the “Connect” button and the blinking LED on the Bluetooth module should become solid. Try turning the laser on and moving the motor! Figure 11: Testing the Buddy Bot in random mode. I also made a housing to put around it and protect the electronics from jumping cats. Figure 12: Testing the BuddyBot with my tablet. This is Bluetooth wireless, so you have to be within about 15 feet of BuddyBot to control it, but you could re-program the app to turn on in random mode at certain times of the day, if you’re willing to leave your tablet within 15 feet of Buddy Bot. So there you have it, you’ve built your very own BuddyBot! Please send us pictures of your furry friend enjoying their new toy. If you make any modifications to the design, please share that as well. We can’t wait to see what you do! 1. Nucleo header pins are identified by both a Morpho and Arduino pin identifier. STM32 Nucleo Pin # and Arduino Pin # refer to the same physical pin. The Arduino Pin # makes it easier to determine which pin to use since they are sequentially numbered. , Arduino™ connectivity support and ST Morpho headers make it easy to expand the functionality of the STM32 Nucleo open development platform with a wide choice of specialized shields. The STM32 Nucleo board does not require any separate probe as it integrates the ST-LINK/V2-1 debugger/programmer. 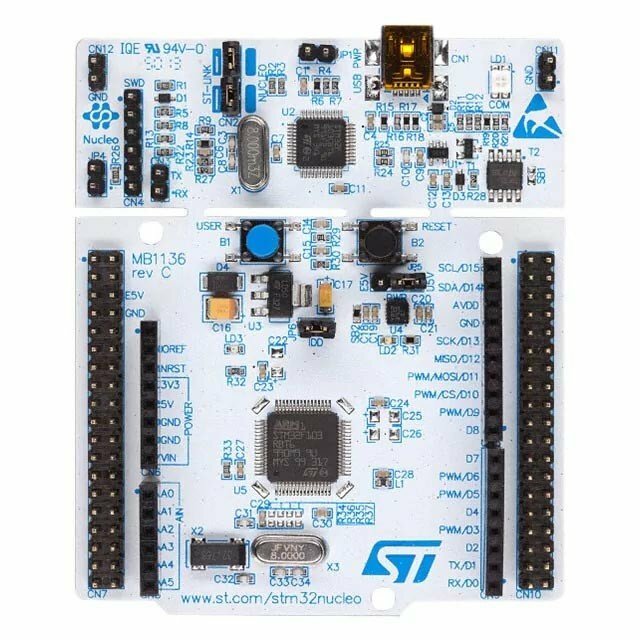 The STM32 Nucleo board comes with the STM32 comprehensive software HAL library together with various packaged software examples, as well as direct access to mbed online resources. The Microchip RN-42 Bluetooth Module is a small form factor, low power, class 2 Bluetooth radio for designer’s who want to add wireless capability to their products. The RN-42 supports multiple interface protocols, is simple to design in, and is fully certified, making it a complete embedded Bluetooth solution. The RN-42 is functionally compatible with the RN 41. With its high-performance, on-chip antenna and support for Bluetooth EDR, the RN-42 delivers up to a 3 Mbps data rate for distances up to 20 meters. Michael Parks, P.E. is the owner of Green Shoe Garage, a custom electronics design studio and technology consultancy located in Southern Maryland. He produces the Gears of Resistance podcast which shares news and tips for those interested in open source product development including embedded electronic hardware, software, and mechanical design. Michael is also a licensed Professional Engineer in the state of Maryland and holds a Master’s degree in systems engineering from Johns Hopkins University.